Curb appeal is undeniably important when you’re selling your home. Sure, buyers are looking at key factors like price, neighborhood and home size. But once those criteria are conquered, you’ll want to landscape the yard to make a positive first impression. Just as it’s important to wear an attractive suit to a job interview, you should dress up your home’s exterior to seal the deal with buyers. Tidy landscaping should be a consideration as seller prepares to list their property. Knowledgeable Realtors know the value of curb appeal and can help sellers ensure they stage not only the inside of their homes, but the exterior. By following the simple tips below, homeowners can put forth their best effort. This is a simple tip, but it’s a vital one. When a home is on the market, the grass must be perpetually trimmed. Do you normally mow your lawn once a week? Consider cutting it even more frequently to keep it tidy at all times. The extra mowing is especially important in the spring, when the rainy season keeps grass growing overtime. Removing weeds takes time but greatly enhances the look of your lawn. The clean lines of a fresh mowing look attractive, but they really stand out when the lawn is trimmed and weed-free, too. Trimming is an extra step some homeowners skip, but it should make be on your to-do list when you’re on the market. Be vigilant about pulling weeds from the grass and the flower beds. Apply fertilizer with weed control to your lawn to reduce your workload. Everyone loves a bit color, and adding a few carefully selected flowers can bring a splash of color and showcase your home. Don’t go overboard with color, but use a few strategically placed flowerpots to enhance the curb appeal. Mulch provides many benefits to gardens and flowerbeds. It helps prevent weeds, retains moisture to keep plants fresh and makes the space look uniform and appealing. 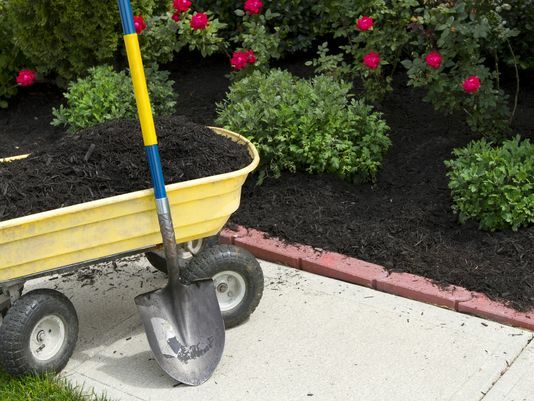 When getting ready to list, spruce up your outdoor spaces with mulch. The good news is that you can do plenty to help your lawn sell your home. The better news is that it doesn’t have to be expensive. Most of the actions you can take just involve a bit of manual labor. If you’re willing to get outside and invest some sweat equity, you can enhance curb appeal with little or no money. While you can easily spend big bucks on new mulch, flowers, plants and shrubs, begin with simple hard work to improve your exterior, attract buyers and sell your home faster.